Crippler Japan on the big hip. Woodward at Copper Mountain, Colorado. On The Hill correspondent Z Griff with Sherman Poppen's original 1960s Snurfer. 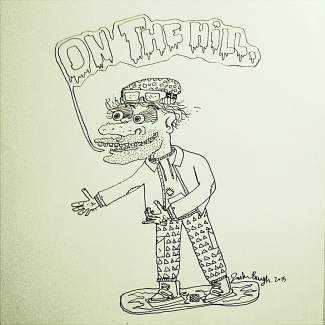 A draft of Z Griff's new On The Hill logo, created by his one-man graphics team, 15-year-old Jack Bauer. Air over the staircase. Woodward summer park at Copper, Colorado. 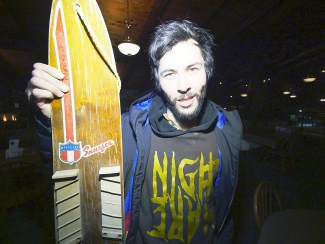 Here’s something you don’t know about Z Griff: He was once a snowboard poster child for the U.S. Air Force. 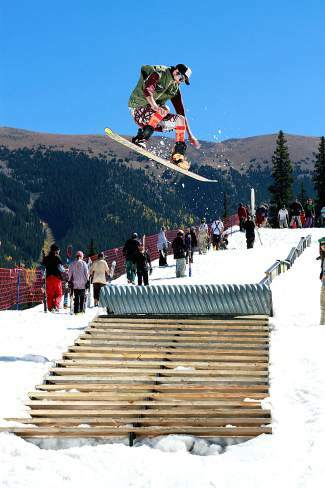 Back in 2004, an Air Force official approached Z Griff (aka Zach Griffin, aka East Coast native, aka adopted Breck local, aka host of our daily “On The Hill” videos) after he had competed in his first and only Burton U.S. Open. At the time, he was 18 years old, the sort of energetic halfpipe rider who grew up watching guys like Ross Power and JJ Thomas pave the way for Shaun White and Danny Davis. Z Griff was also the sort of young, hungry, devil-may-care ripper the Air Force wanted for its then-new slate of ads aimed at — you guessed it — young, hungry, devil-may-care kids. The military needed a face to go with its extreme-sports marketing push; and, after cutting his scraggly mane, he made his national television debut in the “We’ve Been Waiting For You” campaign ad. A hi-res version of the spot is insanely hard to dig up a decade later, even in the darkest corners of the Internet. But it’s not impossible. In it, a young Z Griff rides through gladed trees, tweaks Indy over a boulder drop and eventually gets separated from his group, only to pull out a GPS tracker just in time to reconnect with the rest. It lasts all of 30 seconds and could’ve been the start of a career. Z Griff remembers getting calls from California directors and producers, the movers and shakers who can give a struggling athlete his big break. But it wasn’t quite the break he was looking for, especially after moving to the epicenter of the snowboarding culture he loves. And so, against all odds, he said f*** you to fame. But he hasn’t been able to stay away from the camera. This season marks his second as host of On The Hill, a winter-long series that he hosts, edits and posts to the Summit Daily website five times per week. After more than 150 episodes (and counting) he’s nearly covered it all: opening day with Nate Dogggg and Chad Otterstrom, Breck park laps with his buddy Ian Smith (a Never Summer pro), tips for tuning with the guys at Christy Sports, occasional road trips to Wolf Creek for powder and a mid-winter road trip to the Midwest for urban riding with his crew from Nightmare Snowboards, based here in Summit. Z Griff is a fixture in the county — on the mountain day in and day out — and, like plenty of locals, he works odd jobs. If you live in the Breck area, he’s probably delivered your morning newspaper. Halfpipe doesn’t pay the rent, at least not for the one who walked away.